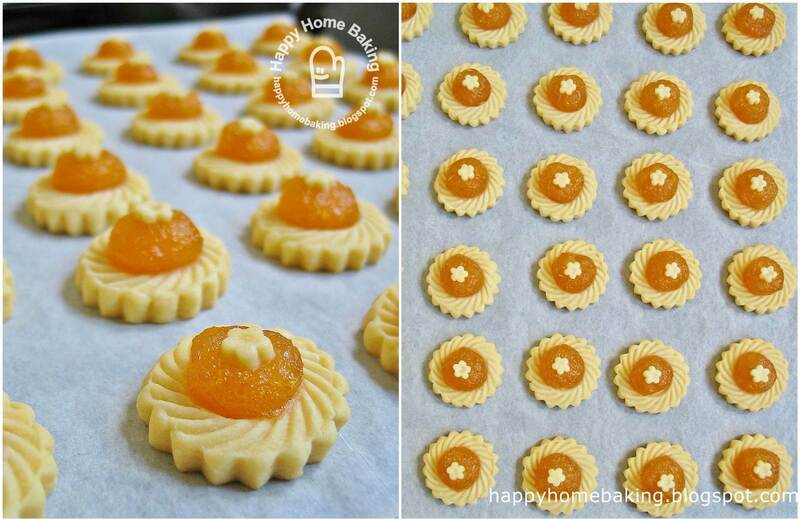 The first runner up on my cookies-making marathon is none other than these Pineapple Tarts. I was almost half-dead after making the pineapple jam, not forgetting the minor cuts on my fingers as a result of being over zealous when grating the pineapples! It took me about 45mins to an hour to cook the jam. The time taken would have been longer, but I stopped when the jam 'appeared' to be fully dried up. Actually the jam was quite soft...it would be better to continue to cook it longer, but I worried I would burnt the whole pot of jam. I rather work with soft jam than to jeopardise a whole afternoon's hard work! After spending 2 hours working non-stop, I completed two trays of pineapple tarts, just a mere 40 tangerine style ones and 30 open tarts. I actually suffered from a bad headache after making them...and had to resort to panadol and a medicated rub on my shoulders before I crept into bed that night. If you were to ask me now, I will tell you, No, I am not going to make them again, never! I have already developed a pineapple tarts phobia! I am lucky that I found a cake friend, she is the first person whom I have this "相逢恨晚" feelings (loosely translated as...it's a regret that we met each other so late). These pineapple tarts are made especially for her as I suspected she doesn't make them, at least, she has never mentioned it to me. I have wanted to tell her, only tell me if the pineapple tarts are nice, even if it doesn't suit her taste, I don't mind a white lie ;) But as usual, I forget about it when we started to engage in a hot topic...that is, about our kids' academic studies! Anyway, I don't know whether it was a white lie, but my friend came back with good comments. It was certainly a pleasure to hear that she was able to mention things like..."there is no buttery aftertaste...did you use Lurpak? and I thought I tasted vanilla, did you add vanilla extract?" Even though I felt sheepish when she mentioned that she tasted some pineapple fibres, but she said it gets to show that everything is homemade from scratch (^^'). I guess for all homebakers, especially self taught ones, these are sincere comments that we treasure, it is through sharing that we would be able to improve our baking skills. Remove the skin on the pineapples (choose half ripened ones as fully ripened pineapples will be difficult to grate and unripe ones will be too sour). Cut away the 'eyes'. Cut the pineapples (lengthwise) into 4 quarters. Grate the pineapples. Drain the grated pineapples, press out the juice with the back of a spoon. Reserve the pineapple juice. Place grated pineapples, cinnamon stick, cloves, and half the amount of sugar in a pot (I used a stainless steel pot with a heavy base). Bring to a boil. Turn to medium heat and let it continue to simmer. Stir occasionally. When the mixture starts to dry up, add in a few tablespoons of the reserved pineapple juice. Continue to let it simmer. Keep adding the pineapple juice as the mixture dries up. Continue till all the pineapple juice is used up. Add in the remaining sugar gradually (a few tablespoons at a time), and keep stirring as the mixture dries up. Adjust amount of sugar according to taste. 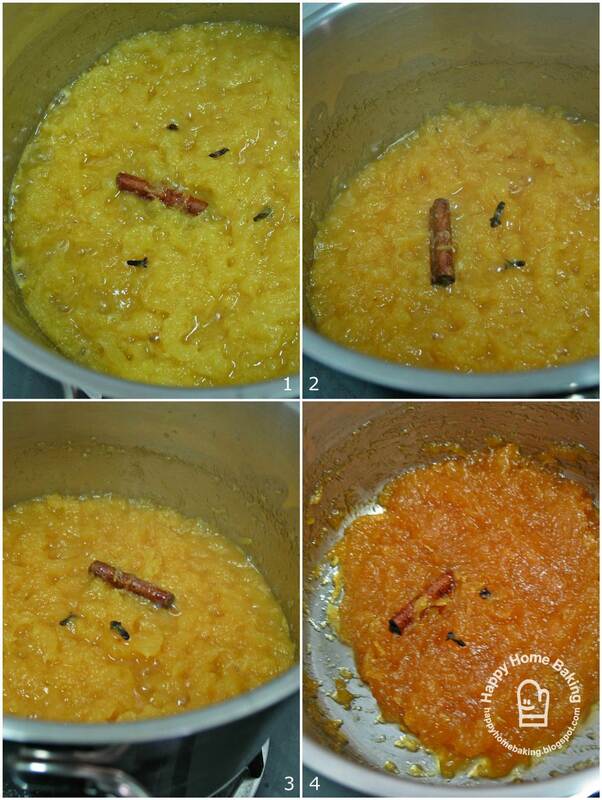 Turn to LOW heat, keep stirring the mixture until the jam caramelised, becomes sticky and dry. Total cooking time is about 1 hour or longer. Leave to cool and place in air tight container and store in fridge. When ready, roll pineapple jam into 6g balls (about 1 teaspoon). Store covered in fridge until ready to use. Place butter (I used unsalted Lurpak) in a mixing bowl. Sift over the icing sugar. With an electric mixer, on medium speed, cream butter and icing sugar till the mixture turns pale. Add in salt, whisk to combine. Dribble in the egg yolks and continue to whisk the mixture till fully incorporated. Sift flour into the mixture. Mix the mixture with your hand and lightly knead for a couple of minutes till the flour is incorporated into the dough (do not over work the dough). Bake in preheated oven at 170 degC for 15 mins. Leave to cool on baking tray for a few minutes before transferring to wire rack. Let cool before storing in air-tight containers. HHB anything that looks this gorgeous should taste great.Yours looks absolutely yummy. Your closed and open pineapple tarts look truly beautiful, and to die for! 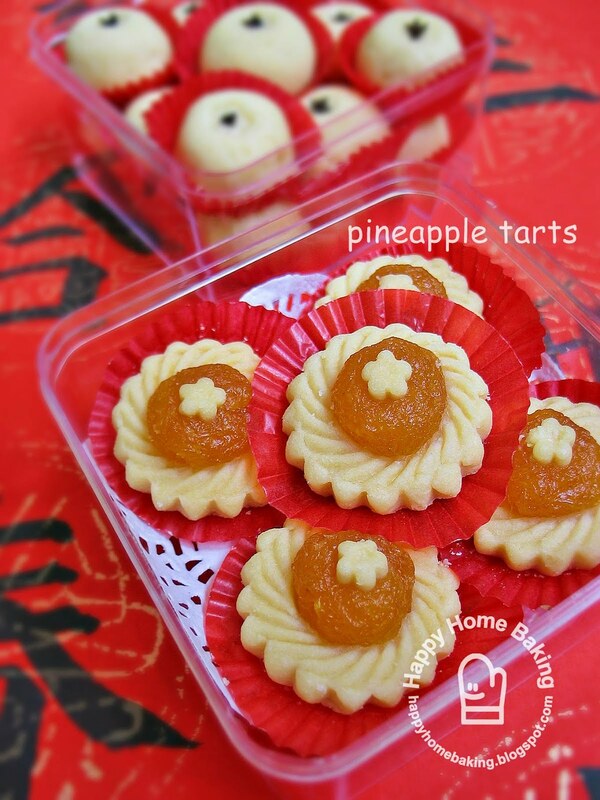 Your friend is very lucky to have the made-from-the-heart pineapple tarts! Happy New Year to you! So true abt the tart requirement and giving to those who know how to bake. I've got a fren who said the tarts are not melt in the mouth which I tried myself and realise it's already "melting". Probably what they din know that those sold outside are laden with some chemicals! I totally agree with you.. I had so much different feedbacks about these home made pineapple tarts that whenever I hear some negative feedback, I feel like giving up this hobby entirely. Some like, some don't like, some loves, some hates. It's really so tiring to please everyone's taste buds. I guess only the people who baked these tarts from scratch will know the hard work behind these little tarts. You make me smile when reading your experiences when making the tarts.I face the same problem too, such a laborious effort.I've resorted to bought pineapple jams for the filling. Anyway I gather you spent sometime in Beijing and as such must be familiar with the city. I plan to go there this February and just wondering whether it is easy take the public transport to explore the city on or own. And if I were to take the taxi how is the fare? What about the city tours are there easily available? Your pineapple tarts really lovely! The open tarts really need a lot of effort. I guess I don't have so much patient like you. Wishing you n your family a very prosperous Lunar New Year. Gong Xi Fat Chai! Elyn, I have learned to give my bakes to only those who will be able to appreciate it, because not everyone thinks highly of homemade cakes and cookies. Happy New Year to you too! Joyce, hope you won't give up baking because of those comments, just shut your ears. I totally agree, only those who have made them will be able to appreciate the hard work involved. Hi NC, it is very convenient to take the public transport, be it bus or the train. Their train system is just like ours. You can google using Baidu (http://map.baidu.com/) for directions...bus number, train stations, etc. Taking cab is convenient too, and it is much much cheaper compared to the fare here. The only thing is, sometimes you may not get a cab during peak hours, and you need to be able to give the direction...do not expect the drivers to know how to get to your destination unless it is some major attractions. You can drop me an email (happyhomebaking@yahoo.com.sg) if you have any specific questions. been reading your posts for quite a few yrs, and I truly enjoy them. just wanted to wish you and your family Happy CNY! 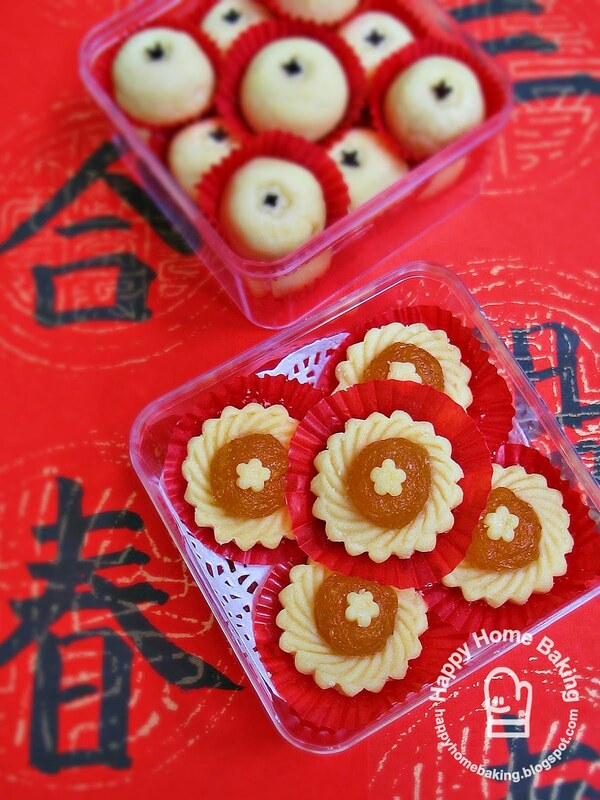 Here wishing "You and family and blessed CNY" Ur open tarts look so refreshing and beautiful. 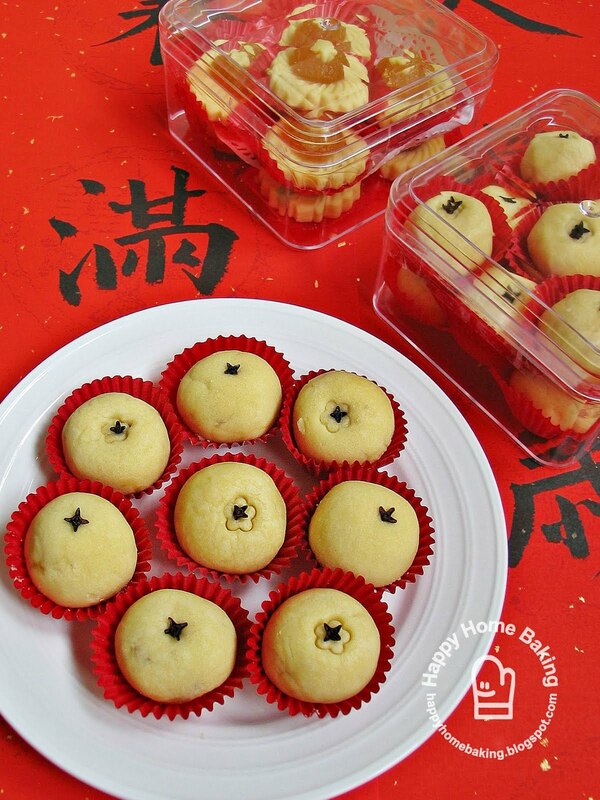 Due to busy at work, i will use ur recipe after CNY to make make some to enjoy. Thanks for sharing ur recipe. love how neat and pretty your tarts look! gong hey fatt choy to you! I don't even imagine how these gorgeous pastries taste like... You should be proud of yourself! 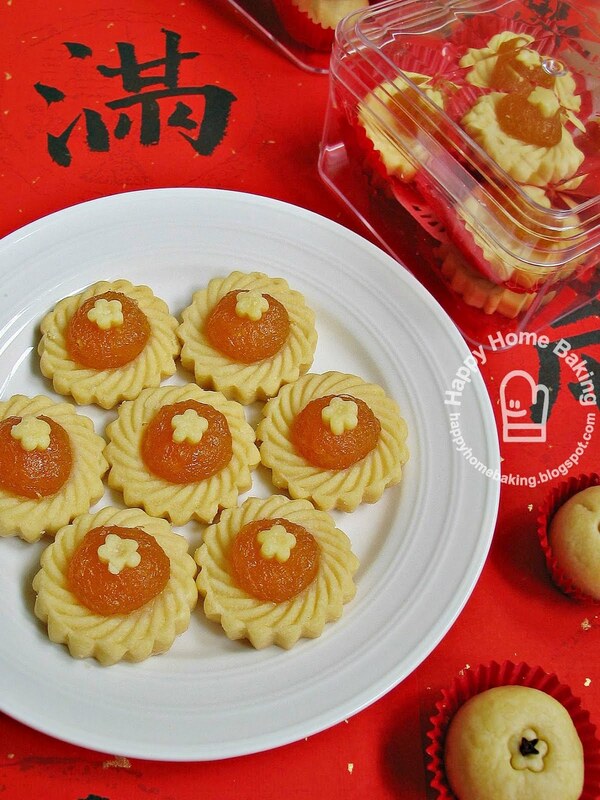 Should I receive a batch of homemade fm scratch pineapple tarts, never mind if the pastry is melt-in-yr-mouth or not, my heart would hv melted first! Anyway, yours are truly a beauty to behold and a work of art. Needless to say, I am certain they are absolutely delicious. ps. this is not a hint! Pls, pls, pls do not send me any! I mean it. 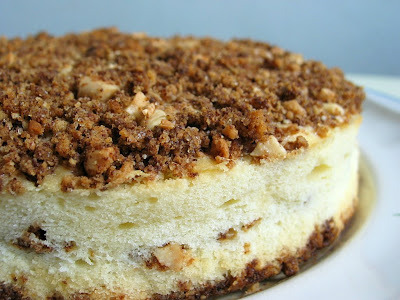 Priscilla, I hope you will like this recipe :) The pastry is those melt in mouth type. Martina, these cookies are too fragile, otherwise I would send you a box anytime! You pineapple tart looks delicious, Wishing You & Family A Very Happy Chinese New Year 2012 & Gong Xi Fa Cai. Hi HHB, I love reading your blogs and home made recipes. The tarts looks perfect, anything home bake is the best! Here's to wishing you, your other half and your adorable boys a Happy Chinese New Year! Hi HHB, thanks for sharing this recipe! I am currently living in the US, for a year, and found that CNY for me this year came with massive cravings for CNY goodies! Hence I went ahead to bake pineapple tarts using your recipe! A question though... I found the dough extremely hard to handle... it kept cracking! Do you have a clue as to what I could have did wrong? Thanks again! I understand how you felt, that is why I TOTALLY bake NOTHING this year, to really enjoy new year in another way, sometimes we need to rest and pamper ourselves and maybe eat what others bake. Happy New Year. Tq for the info.and it is nice of you to let me contact you. Hi Showers, Sorry to hear that this recipe didn't work well for you. Yes the pastry dough breaks easily, it is difficult to roll, difficult to unmould from the cutter and also difficult to wrap especially if the jam is soft. That's why it is quite a tedious task, it takes lots of patient and some practice to get the hang of it. your open tarts look beautiful, I like the little flower decoration on top. What tool did you use to make that little flower? I tried making my own jam this year after reading your last attempt. It took me so long and only so little jam. But it certainly taste better than the store bought one. Thanks for your post. Happy New Year. Hi Ottyen, I used a mini cutter to cut out the flower decoration. It is meant for fondant...got it from Phoon Huat, comes in a set of 3, about $16! I didn't know it is so expensive (no price tag) if not I wouldn't have bought it. It is my most expensive baking tool! You should get about 450g of jam for 2 pineapples, maybe the pineapples you bought were very small ones?? Can you please explain what you mean by half ripped pineapple? Do I rip it in two? How is it an unripped pineapple be sour? Is it because it's not exposed to air?? Seriously, I'm confused! Hi Jer-nie, sorry for the confusion, it was a typo error. It should be half ripened. my apologies! What is the diameter of the tart cutter that u used? Tx again! Hi, i got it from Sun Lik. The size of cutter is about 1.5"
I am sorry I have not tried golden churn butter (can form), been using Lurpak. Hi, may I know which version is easier to make - open face or tangerine type? Your tarts look pale. Once i thought these photos were taken before they were baked. Hi, no worries, that's because I didn't brush the cookies with egg wash.
My name is Samantha and I have previously messaged you with regards to participating in our charity bake sale. I understand you were busy. While the bake sale is over, I am writing to seek an interest in being our lead baker for our next event on the 21st of February. It will be a pineapple tart baking session for the mentally challenged at the moral welfare home. Everything will be provided but we just lack an awesome pineapple tart expert :) The purpose of the event is to really extend the festive spirit of giving and reunion to the less fortunate. Let me know if you can join us, we will really appreciate it! The event will take place from 1000-1500 but you can probably leave before that, because the event includes performance as well. Hi Samantha, thanks for the invitation. It is with regrets that I am not able to commit my time to participate in this meaningful event due to my family commitments as I am a full time housewife with no other help on hand. I hope you understand. I wish you great success in your event! No worries. I understand :) Have a happy chinese new year! May I ask if you are open to receiving 2nd hand containers to store your cookies? A few eco-conscious people are finding ways to give the containers they are holding on to a 2nd life, but we know that commercial bakers will be less receptive to our donations because of liability to customers. Hope you will be open to it! We will make sure they are washed extremely thoroughly and it is just a small group of us. You could check out the facebook group Journey To Zero Waste Life in Singapore. Hope to hear from you soon! Thank you! Hi Jia Xuan, thank you for your kind gesture, however, I have many recycled containers too. I hope you are able to give them to other home bakers, and I wish you success in your event!